PARROT MOON (D. Trimmer) Tetraploid (Orange Thrill x Orange Blossom Trail) 29” EM. Re. Ev. 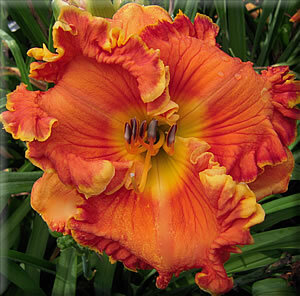 6 ½” In my opinion this is my finest orange to date and I like orange daylilies! 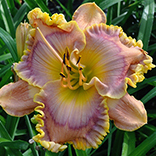 PARROT MOON is a very round, ruffled, full-formed deeply intense orange set off by a chartreuse green throat and gold edge. We wanted a special cultivar to carry on with our Parrot theme from the past few years and, with PARROT MOON we have that. If I had more stock this might have been my catalog cover. This Parrot has three branches and about 20 buds and is fertile both ways. This PARROT MOON has color, color, color!